Ohio Party Bull has a great selection of popular bounce house rentals, with style that are designed to please. Like our exciting castle design that are perfect for your little princess parties, school fun days, or the ultimate "fort" for brave knights! 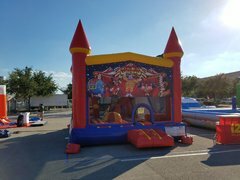 All of our bounce house rentals are cleaned and sanitized before every rental and are manufactured from "lead-free" vinyl for child's and guest's safety. Browse the selections below and click on the image or the "more Info" link to get additional information and to make a reservation.